In need of entertainment for the big kids? 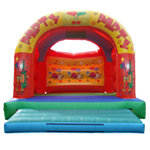 If so please take a look above at our 15X17 party time inflatable (images of drinks bubbly ect...). This bouncy castle has extra high walls for adult safety and comes complete with a shower cover.